Amkette is no doubt one of the leading electronics brand in India. With introduction to music segment, they have launched this pocket sized ultra portable music gadget “Amkette Trubeats Solo speaker”. So get ready to unleash the party, from your pocket. Amkette Trubreats Solo is no exception when it comes to music and extended playback experience. We got hold over the recently launched Amkette Trubeats Solo speaker and we are quite impressed with the speaker design, long lasting battery life, and the ease of connectivity. We will be demonstrating on the features and details of this gadget in a much detailed manner with various aspects of this device. 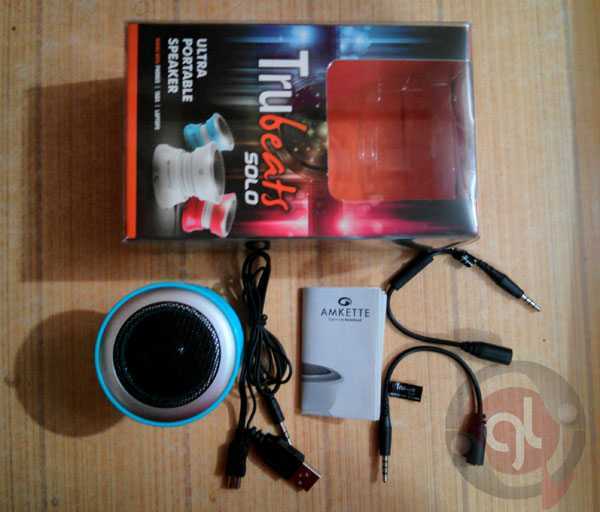 Amkette Trubeats Solo Speaker comes in a unique single layered plastic moulded case with essential card paper package portraying the Amkette Trubeats solo speaker, features, and specifications inscripted in it. The packaging of Amkette Trubeats Solo is pretty and uniquely designed. Coming to the design aspect of Amkette Trubeats Solo speaker, it is undoubtedly designed unique with its unibody design. The speaker is made of hard plastic material which feels very premium. The design simply represents an indian musical instrument named, “Dumru”. The top surface of the Amkette Trubeats Solo speaker covers the speaker output grill, where bass and sound is emitted. The speaker is designed very compact and ultra portable where the speaker can be pressed and locked to a more compact size due to its unique flexible spring actioned middle body. The speaker has an led light for power indication placed at the very bottom of the screen. A power button is provided with function to power ON and OFF the speaker. There is a dedicated volume rocker key to control the volume output of the speaker. To charge the device, there is a micro usb port provided with the speaker and beside that, there is a 3.5mm audio jack for audio connectivity. The design and quality of the product is really nice and we have no negative points for the same for the price it is been offered. 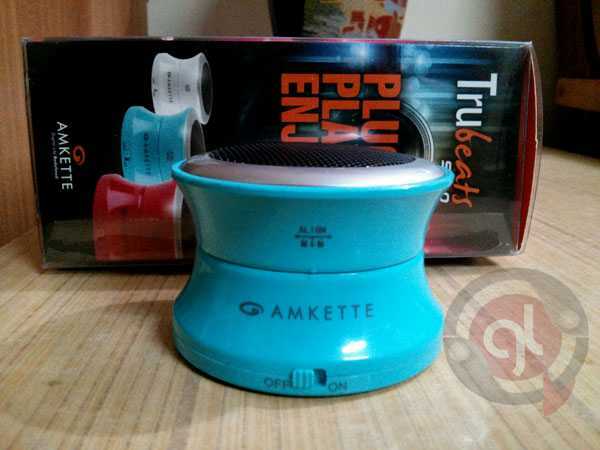 The Amkette Trubeats Solo speaker is supplied with a male micro usb to male standard usb port + 3.5mm audio plug for connectivity. Do not mistake this speaker for wireless connectivity as it doesnt support bluetooth or other wireless medium. At this new tech generation, people may find the wired connectivity speakers a burden but it still lies at the individual likes and preference. To connect the speaker, one just simply need to power ON the device with the dedicated power key provided within the speaker and simply connect the cable provided with the package where the micro usb port goes to the speaker’s micro usb jack and the other end which is a standard 3.5mm audio jack is connected to any multimedia device such as smartphones, tablets, ipods, music players, etc for the music input. It can also connect multiple Amkette Trubeats Solo speaker or any speakers which could be connected with the help of the unity cable. 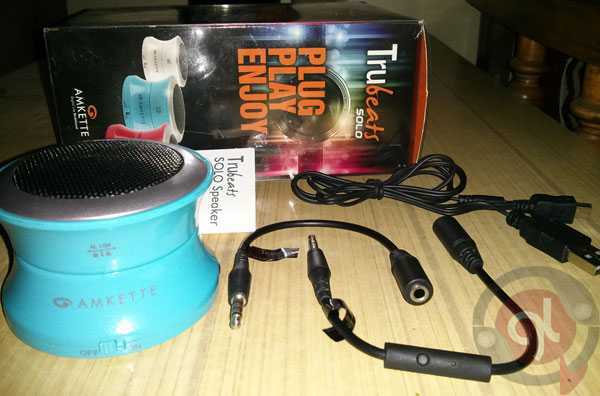 Amkette Trubeats Solo speaker is provided with a Speakerphone add-on cable which can be used for handsfree calling. The connectivity procedure is a bit confusing for novice users due to the strange 3 in one cable provided with the Amkette Trubeats Solo speaker package. Also, wired connectivity is a bit disappointment and not preferred by a large percentage of users. 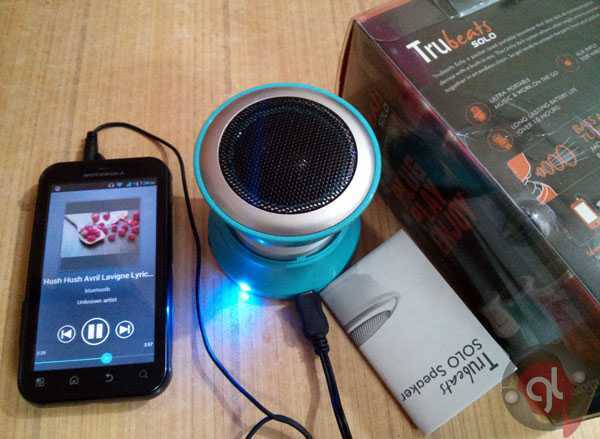 Coming to the performance point of view, Amkette Trubeats Solo speaker is indeed a great product for the music lovers. The bass output is sharp and soothing to ears. The speaker is loud and quality of music sounds great with this little device. Inspite of great bass, the speaker unit doesnt vibrate from the ground surface due to the rubberized flat layered sheet beneath the Amkette Trubeats Solo speaker. Although the sound output is decent, we cant term it as really awesome when we have a competitive counterpart which we reviewed recently : Soundwave Wireless Portable Speaker. The Soundwave Wireless speaker performs better than Amkette Trubeats Solo speaker within almost near to its price range. Still, we wish to clear that this speaker is not bad at all and performs really nice. The battery backup of Amkette Trubeats Solo speaker is really amazing with flat 6 hours of playback at the highest volume of this speaker. THe product specifications mention 10 hours of playback but our tests fetched a flat 6 hours playback time with volume kept at its highest possible. We are amazed with such long battery life. Whenever you are out on picnic, this speaker will not let you down with its long lasting battery backup. With great value for money counterpart Soundwave Wireless Portable Speaker, you will be confused at this little pretty gadget by Amkette with its Wired connectivity. 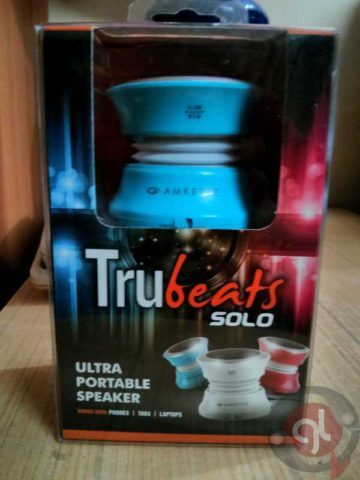 If Amkette Trubeats Solo speaker was provided with a wireless connectivity option, this product would have marked a great value for money segment. 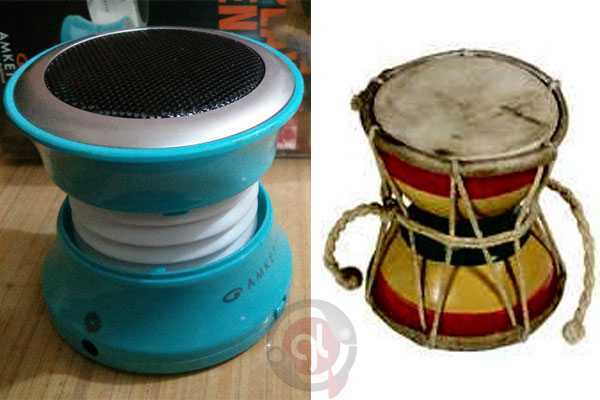 The maximum retail price of this Amkette speaker is 1,295 INR. You can purchase this product from various indian online shopping sites such as Flipkart, Snapdeal, Infibeam, and Homeshop18. Apart from that, it is also available at Amazon.com and Amazon.in.